In location where the level of river or smaller stream is changing abruptly there forms a waterfall - one of the most fascinating monuments of nature. The highest waterfalls of the world are up to 1 kilometre high. Short-lived waterfalls which form after rainfall and pour down along abrupt cliffs could be even much higher. In Latvia there are no high mountains and thus here are no high waterfalls. 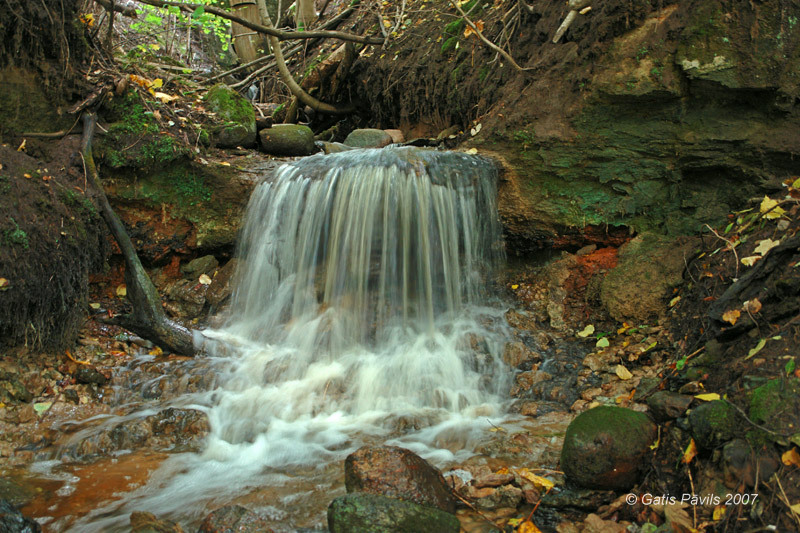 But here are exposed solid rocks and in several regions of Latvia there are found small waterfalls up to few metres high. Many of these waterfalls are picturesque and tourists love to visit them. The most popular one is the widest waterfall in Europe - Ventas Rumba, 275 metres wide and 1,6 - 2 metres high. There are no persuasive minimum criteria for waterfalls - but even in Latvia the steps where water falls less than 20 centimetres are not considered to be waterfalls. Latvia has got few permanent waterfalls on all-year-round rivers - thus there are searched and studied also small streams which fall over the cliffs only during intense rainfall. During the wintertime in such locations there often form beautiful icefalls which are considered to be valuable monuments as well. Rapids - locations where there forms a rapid flow or where the river crosses numerous boulders - can be picturesque monuments of nature as well. Only the largest and most impressive rapids shall be considered to be landmarks - there are too many smaller rapids in small streams. Latvia has got at least 150 such waterfalls, icefalls and impressive rapids. Below are listed all the waterfalls described in this website. Each column in this table is sortable by alphabet - just click on the header of the table. The first column - "No." - gives an order of appearance of the landmark in this website.